I know this is not directly related to interior design, but think of it as a peak inside my medicine cabinet and shower, hah! Also look at it as a way to get to know me. Afterall, the “Show Us Your Life” meme is all about showing how you live! Today’s SUYL is all about Beauty Secrets. For the most part I wash my hair at night when I take a shower before bed. 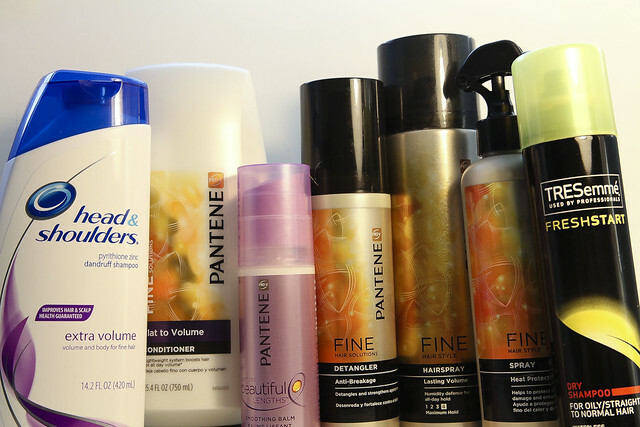 Most of the products I use are Pantene Pro-V’s Fine Hair Solutions products. I use Head & Shoulders volumizing shampoo because it helps with my oily acne-prone scalp. I use the Pantene Pro-V volumizing conditioner, and I spray the anti-breakage detangler on it while it air dries. If I do blow dry my hair I work in the Restore Beautiful Lengths Smoothing Balm to protect my hair because I do try to grow it out long, and then I spray in the Heat Protection & Shine Spray. To set my hair, I use the Lasting Volume Hairspray. And on those days where I skip a shower I use TRESemme Fresh Start Dry Shampoo. After years and years of going through different skincare products, my battle with acne is finally over. I’ve figured out what makes my skin happy. 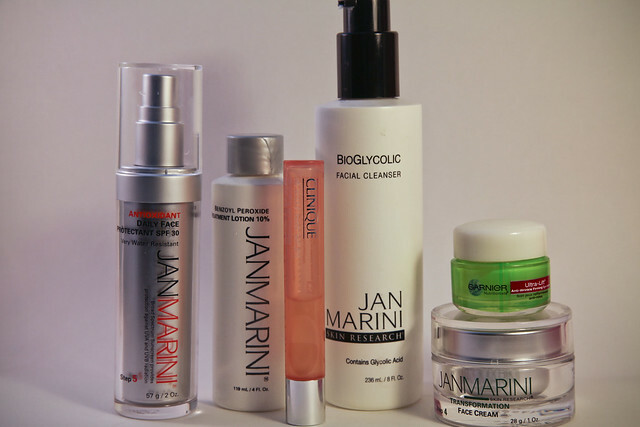 When I got my very first facial at Hoshall’s Salon & Spa my esthetician recommended I try Jan Marini’s Bioglycolic Face Cleanser (found out my aunt, who is a professional make-up artist, uses this cleanser too). I use it morning and night, and it WORKS. I’ve strayed a few times from it, and every time I have my acne has flared up. As soon as I go back to the Jan Marini cleanser my skin is happy again. AM – in the morning I use the Jan Marini cleanser, Clinique’s All About Eyes Serum De-Puffing Eye Massage, Jan Marini’s Benzoyl Peroxide Lotion, and Jan Marini’s Antixoxidant Daily Face Protectant SPF 30. PM – At night I use the same Jan Marini cleanser, Jan Marini’s Transformation Face Cream, and Garnier Ultra-Lift Anti-Wrinkle Firming Eye Cream. 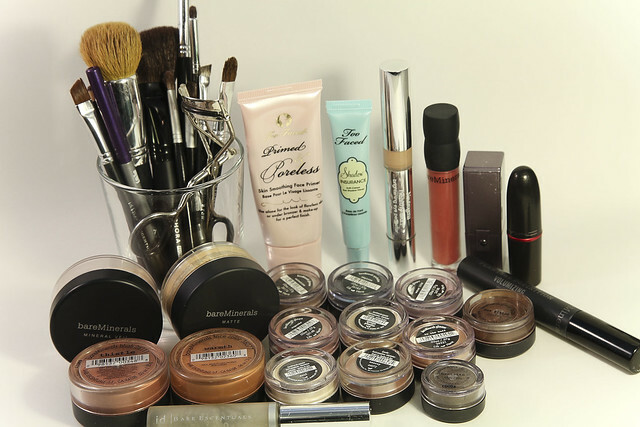 I started using Bare Escentuals back in 2006 and have used them ever since. I use their foundation, Mineral Veil, All Over Face Color, blush, eyeshadow, mascara, brow kit, and lipgloss. Neutrogena’s Healthy Skin Brightening Eye Perfector is my under-the-eye concealer. For my lips I use Tarte’s FRXtion Sugar Lip Exfoliator and Soothing Balm as a base to clean my lips off and get it moisturized before I either put on my lipgloss or M.A.C.’s Viva Glam V lipstick. In addition to these products, I also make sure to drink lots of water and take vitamins. I take a multi-vitamin for women, and extra Vitamin C, Calcium, Magnesium, Zinc, Probiotics, and Omega 3. The book Eat, Drink, and be Gorgeous: A Nutritionist’s Guide to Living Well While Living It Up has a great section on different vitamins to take. I’ve always liked the way your makeup looks, and after discovering your secret of Bare Escentuals, I thought I’d give them a try. Wow – I have seriously been missing out all these years! I’m completely blown away by how amazing these products are. Thanks for showing us your life!